Cook with Cindy - Food, Fun, and more! : ICE CREAM!...ICE CREAM!...AND MORE ICE CREAM! I love ice cream. Next to Cheesecake, of any flavor, it is one of my favorite desserts. 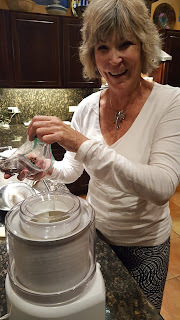 On New Year's Eve I helped my good friend Debby Vis make ice cream for the first time. She is such an accomplished home chef that making ice cream was easy for her. Deb made the custard base night before we arrived. into the ice cream mixture as it churns. I found this recipe on the 'Taste of Home' site. I use this site a lot and have never been let down, and this recipe is no exception! I nabbed this photo from the 'Taste of Home' site. No time for food photos! Ours looked as good, if not better! In a small skillet, toast the pecans in butter for 5-6 minutes until lightly browned. Cool. In a heavy saucepan, heat half and half to 170 degrees, whisking occasionally. Stir in brown sugar until dissolved. Whisk a small amount of hot cream mixture into the eggs; return to the pan, whisking constantly. Cook and stir over low heat until mixture reaches at least 160 degrees (no more than 170) and coats the back of a metal spoon. Remove from the heat. Cool quickly by placing pan in a bowl of ice water; stir for 2 minutes to cool it down. Stir in heavy whipping cream and vanilla. At this point if you have any lumps, because a little of the egg "cooked" when adding the hot half and half into the eggs, strain into a bowl through a fine mesh sieve pressing the custard through, but leaving the lumps behind. 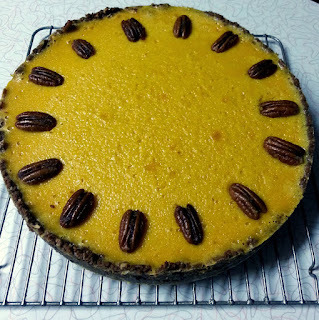 Press plastic wrap onto the surface of the custard so a crust does not form and refrigerate several hours or overnight. I prefer to make the custard the day before for 2 reasons: 1) you know it is perfectly chilled when time to churn and, 2) it helps by having this entire step done ahead of time. Freeze according to manufacturer's instructions. 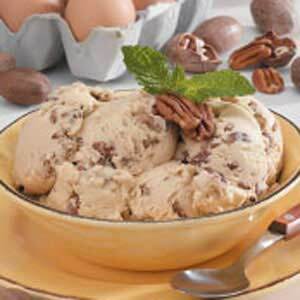 As you begin to freeze the ice cream pour in the toasted pecans. My Cuisinart Ice Cream maker usually takes between 20-30 minutes to freeze, but everyone is different. After churned, remove from the ice cream maker and pour into a freezer-proof bowl and freeze for 2-4 hours before serving. 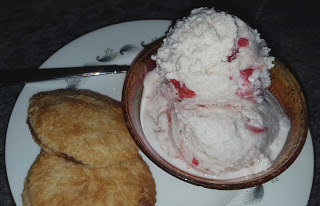 Since a kid, one of my all-time favorites is Vanilla Ice Cream. From this basic, but delicious recipe you can add all kinds of fruit or other flavorings to change it up, but I like it just like this--creamy, eggy and delicious! 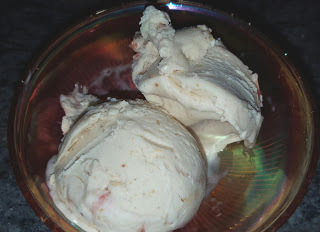 * I have never used a vanilla bean and the ice cream is delicious using plain old vanilla extract. In a small saucepan over medium heat, bring the half and half and vanilla bean (if using) to the scalding point (the milk begins to foam up). Remove from heat, take out the vanilla bean and scrape the seeds from the bean with the back of a knife, and mix the seeds back into the half and half. Meanwhile, in a stainless steel bowl beat the egg yolks and sugar until light and fluffy; about 2 minutes. I use a hand mixer, but you can also do this with a wire whisk. It will take much longer. Gradually pour the scalding half and half into the whipped egg yolk mixture, making sure you keep whisking constantly so the eggs don't curdle or "cook". If any lumps do form, strain through a fine mesh sieve before re-heating. Place the bowl over a saucepan of simmering water (double-boiler effect), and stir constantly with a wooden spoon. Cook until the custard thickens enough that it coats the back of a spoon; or until custard reaches 170 degrees. Immediately remove the custard from the heat and continue to stir for a few minutes so it does not overcook. The stirring helps cool it down. At this point stir in the vanilla extract (if using). Cover with plastic wrap pressed onto the top of custard and cool until reaches room temp and then place in refrigerator for several hours, or overnight. Transfer the cold custard to the chilled container of your ice cream machine and process according to manufacturer's instructions. 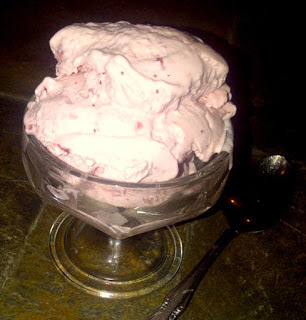 Once made, transfer the ice cream to a container and store in freezer until ready to serve. 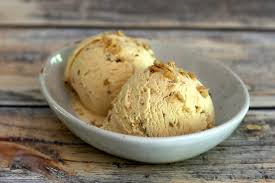 If the ice cream becomes too hard, place in refrigerator until softened--15-20 minutes. scrumptious as Vanilla Ice Cream! Next, I'm giving you a recipe I found on another excellent food blog, Allrecipes. 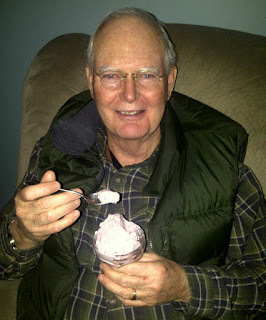 When our good friends Joe and JoJo Hammond came for dinner I served this ice cream for dessert. Turns out JoJo's favorite is Maple Walnut, as was my dear Mom's. I've tried a lot of different Maple Walnut recipes, but this is my favorite. We always got our maple syrup from Putnam's farm in Charlestown, NH; absolutely the best, and a beautifully run, multi-generational, owned and operated family farm. Pour heavy cream into a large bowl and set a mesh strainer over the bowl. Whisk egg yolks together in a separate bowl. Heat milk and sugar together in a saucepan over medium-low heat until milk begins to steam, about 5 minutes. Slowly pour about 1/2 cup heated milk into the egg yolks, whisking constantly. Scrape egg yolk mixture into the saucepan with a heatproof spatula. Cook and stir milk mixture constantly with the spatula, scraping the bottom and sides of the saucepan often, until mixture thickens and coats spatula; about 10 minutes or until it reaches 170 degrees. Remove saucepan from heat; pour mixture through a fine mesh strainer into the heavy cream. Stir 3/4 cup maple syrup, coarse salt, and vanilla into cream mixture, then place the bowl over a larger bowl of ice water; stir to cool to room temperature. Press plastic wrap on the surface and chill the mixture in the fridge, about 2 hours, or overnight. Preheat oven to 275 degrees. Spread walnuts onto a baking sheet. Toast walnuts in the preheated oven until they turn golden brown and become fragrant, about 15 minutes. Set nuts aside to cool to room temp. Chop nuts coarsely. Heat the (fat) 1/2 cup plus maple syrup in a saucepan until it comes to a boil. (This reminds me of days visiting the Putnam's Sugar House with my Dad...the sweet smell of sap boiling!) Stir in walnuts and return to a boil. Stir nuts for 10 seconds or so, remove from heat; set aside to cool completely. This can also be done ahead. The nuts will be wet and sticky when cooled. Remove custard mixture from refrigerator; pour into ice cream maker, and freeze according to manufacturers instructions. During the last few minutes of churning, stir in wet walnuts. Peanut Butter and Strawberry cookies. Oh my! Having goats milk on hand made it easy! I made this one for my husband's birthday one year. How can you go wrong with fresh strawberries, cream and eggs? 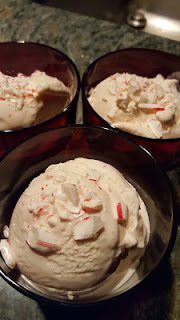 This last recipe is a "cheating" Ice Cream, but so delicious and nobody has to know. Scroll down to the bottom to find this recipe. Really fun way to add a festive and easy treat to Thanksgiving dessert. 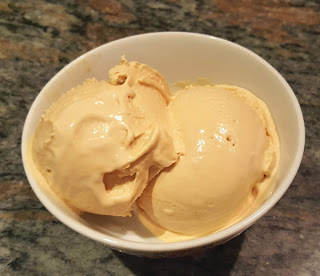 that year with the Pumpkin Ice Cream. Until next time, keep indulging, keep experimenting, keep cooking, and keep on having fun in your own kitchen! Jerry ALWAYS enjoys a little ice cream!